Berwick’s Bailey Jankovic has gone through hell in his short life. But the brave five-year-old just keeps on smiling. Born eight weeks premature and weighing in at only 1900g, he was rushed to the Royal Children’s Hospital for a bladder operation when only three days old. Since then the plucky Harkaway Primary School student, who has Cerebral Palsy in his legs, has had 10 operations and splints and survived a brain bleed at six months old. Bailey has his legs strapped to help maintain their length, relies on a walking frame, a wheelchair and needs assistance to get dressed. He is unable to independently hold a knife or fork and has a full-time aide, monthly occupational therapy and fortnightly physiotherapy sessions. But despite the hardship, Bailey’s mother, Michelle says he is known for his chirpy personality. 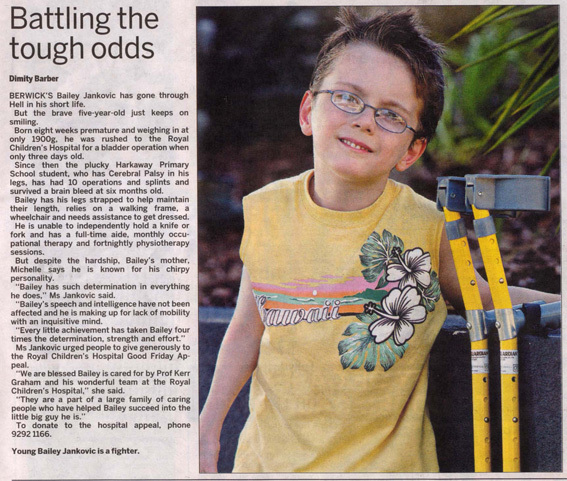 “Bailey has such determination in everything he does,” Ms Jankovic said. Ms Jankovic urged people to give generously to the Royal Children’s Hospital Good Friday Appeal. “We are blessed Bailey is cared for by Prof Kerr Graham and his wonderful team at the Royal Children’s Hispital,” she said. To donate to the hospital appeal, phone 9292 1166. Young Bailey Jankovic is a fighter.